Although this melody title survives in six handbooks from 1530 to 1802, two of them (1647 and its 1692 reprint) are versions of a completely different melody,7 while the music and section titles in 1802 seem to be copied from 1589 (though the lyrics were not included). Thus the comments here need concern only the first three versions: those from 1539, 1585, and 1589 (reprinted 1609). These three musically related versions all connect the melody to the Yan Ziling story given above. The 1530 version mentions this only in a short note at the front, but the 1585 and 1589 versions both have prefaces giving further details. The lyrics in all three are related but not identical. In addition, the melody of Qiu Jiang Wan Diao has a clear musical relationship with the instrumental melody Spring[!] River Evening View (Chun Jiang Wan Tiao) of 1525. This spring river melody is in turn related to other spring river melodies published around that time.10 Earliest is the Chun Jiang Qu of 1511, with completely unrelated lyrics and associated with Guo Zhen. More closely related are the instrumental Chun Jiang melodies, such as those published in 1539, 1551 and 1557; some of these are associated with the Song dynasty essayist and poet Yu Ji. None, but below the title are the words, "Shang mode, 8 sections, by Yan Ziling of the Han dynasty". riding in a boat, or setting up a tent? and facing the slanting sunbeams? soon what have they become? Days and months fly by like a shuttle. Pleasure, pleasure, who realizes it? Down comes the mist and solitary ducks gather to fly. Times like this allow one to forget obstructions (in the stream of life). No restraints and no binds, attaining one's ends. Not aware of whether society is experiencing peace or danger. Blue waters and green mountains, at sunrise clouds gather. Evenings are cool, a gentle breeze, only seeing all around the wind soughing. Everything is contemplated and all attained, effortlessly make predictions mid-stream. no glory, no disgrace, no grief, just rambling and wandering, attaining freedom. As grass and trees wither and fall, you see geese southward flying. Water and sky are one color, hard to distinguish; everything (is like) green porcelain. Amiable, carefree and at peace, in a pale bamboo hat and green raincoat. Slanting wind, fine rain, no need to return home. Populated areas basically do no have waves, without interest you look at it, (as if) all day wind and waves. Round the clock how much of shock and suspiction one suffers. Only when I reside amongst waters and clouds in the countryside, whole life forgetting cravings, far from "fast horses with light fur". The Mysterious Truth Sage is then my friend, "Nature Follower (Lou Guimeng) my teacher. Discard skins and furs, wasted in the order to search (for me) here by the rivers and lakes. Fish frolic, kites fly, to and fro in the bright heavens and shadows of clouds. Calm and quiet, (from the) shallow banks there is no sound. Green vapors, light ripples. Sigh passing away like this, bright soaking everything. Like getting sacred clarity, enjoying letting out a fishing line. Facing reed flowers white, smartweed flowers also red, hibiscus seam, adorn autumn style. Both banks red maples, with yellow leaves, all day jade dew and precious breezes. Not knowing north or sout, west or east. Beginning to dwell without time reaching what is sufficient, laugh that among people no one else follows along this way. Really these rivers and mountains don't exchange with the Three Dukes; comrade of fish and shrimp, firend of gull and egrets. Alas! As for all things: none affects my will. Calmly getting a bit of food is better than 1,000 measures. Cool winds arise all around, casting aside the summer heat, the cultured world is as nothing. It is enough to have coarse clothing, pleasant plain food, allow suspend purple silk purse, carry goldfish (tallies). In the arena of fame how can my heart seek fame and profit? Lie down in the sun, as it slants in the west, when I get a fish then buy some wine. When enebriation comes take my long walking stick and hold it in my hand, one sound lacking. (Autumn River like a raw silk thread, make a misty wave fishing old man. 25505.69 秋江 Qiujiang "A river on an autumn day"; mentions no specific river with this name and does not mention Qiujiang Wandiao. Faming Qinpu does not mention the mode, but later handbooks include it in the shang mode. 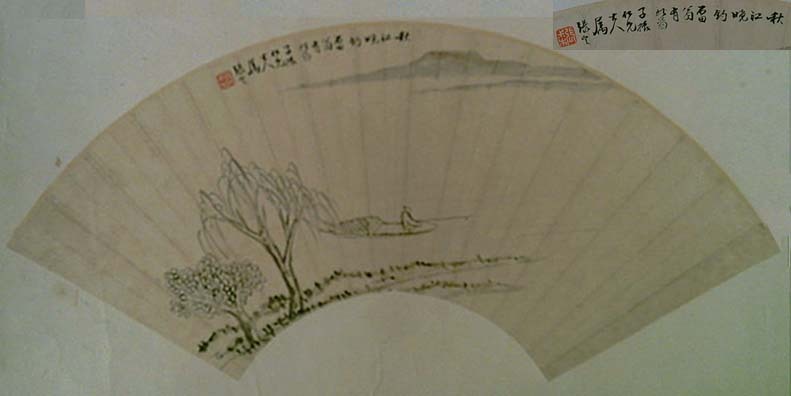 An internet search will show several paintings with this title; the present one is copy of a fan painting signed 張定 Zhang Ding (張叔木 Zhang Shumu), Qing dynasty. 4689.47 and Bio/812 嚴光 Yan Guang have basically the same information as in Giles, A Chinese Biographical Dictionary: Yan Guang 嚴光 (Ziling 子陵). A friend in youth of the Emperor Guang Wu of the Han dynasty. When the latter came to the throne in A.D. 25, he sent to summon Yan Guang to court; but Yan Guang preferred a life in the country, devoted to fishing and agriculture. On one occasion when the old friends met, the Emperor insisted on their sleeping together; and during the night Yan Guang put his foot on His Majesty's stomach. Next morning the Grand Astrologer reported that a strange star had been seen occupying the Imperial place; at which the Emperor laughed and said, "It's only my old friend Yan Ziling, with whom I was sleeping last night." 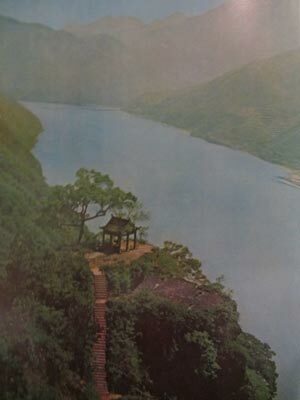 The Fishing Terrace to which Yan is said subsequently to have retired is discussed above and picture below. The 1589 and 1647 versions have prefaces which tell essentially the same story, though 1647 is somewhat elaborated. There are no poems attributed to Yan in Yuefu Shiji, nor have I been able to find others elsewhere. 5. For more on reclusion see Alan Berkowitz, Patterns of Disengagement, Stanford U. Press, 2000, pp. 102-104. As of 2012 the modern tourist site, on the 富春江 Fuchun River about 10 km downriver from where it is joined by the Qu Jiang, was difficult to locate on a map. One way is to do a Google map search for "浙江杭州桐廬縣嚴陵塢" (Tonglu, Yanlingwu, Hangzhou, Zhejiang by itself does not seem to work), which finds Yanlingwu, then turn on photo view: across the 富春江 Fuchun ("Abundant Spring") River) from Yanlingwu are links to a number of photos that show areas around the dock at which boats land for visiting the two fishing terraces, which requires a steep uphill walk to a cliff. 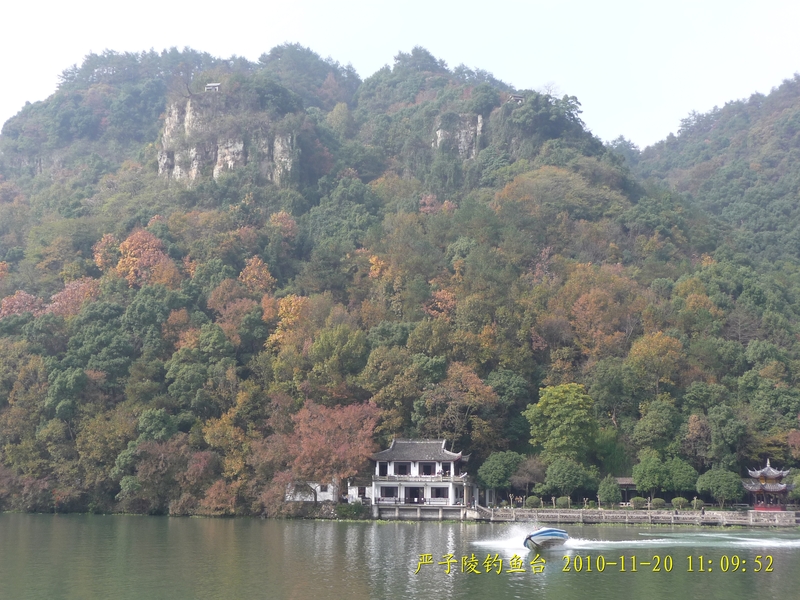 One of the photos linked is this one, copied here from 從遊艇上看嚴子陵釣台秋色 (From a Passing Skiff Viewing Autumn Colors at Yan Ziling Fishing Terrace), taken by someone identified only by the name "lxp455" (see more). The fishing terraces can be seen on cliffs to the upper right and left of the image. When I visited the terrace in 2002 with fellow members of the New York Qin Society we found basic accommodations, but we did not have time to stay - only to make the steep climb up to the terrace on the cliff. The photo at right was copied from page 88 of China, Land of Splendours, which features photos taken in China before 1949. The caption identifies the terrace as being at 七里瀧 Qililong (compare Qili Tan). "Lyrics similar" means that the lyrics of the versions are similar throughout, differences mostly being character substitutions, perhaps to fit the somewhat differing melodies. Regarding differences in the three versions, all three use the formula for pairing lyrics and tablature commonly used at that time: one character for each right hand stroke. Many of the differences between the lyrics of 1530 and those of 1589 are due to the fact that the latter uses two characters for the left hand technique 對起 duiqi, in which the left ring finger remains pressed to the string while the left thumb plucks it. Zheyin Shizi Qinpu uses this pairing technique for duiqi, but Faming Qinpu has only one character with each duiqi. Qilitan (4.199): "地名，一名七里瀨，浙江桐盧縣嚴陵山之西 the name of a place, also called Qililai (and Qililong? ), on the west side of Yanling mountain in Tonglu country of Zhejiang." The entry quotes a reference in the biography of Yan Guang in the Latter Han Dynasty History, saying this was a seven li stretch of the 富春渚 Fuchun riverbank (islet?) in which he had his fishing terrace. Zha Guide 19/183/-- lists 春江晚眺 Chun Jiang Wan Tiao as occuring only in 1525. The other 春江 Chun Jiang melodies are indexed under 春江曲 Chun Jiang Qu, see 14/150/267. This latter includes seven handbooks from 1511 to 1596, but the Guide does not include two books that have it, 1551 and 1556, plus one of these is unrelated, so altogether there were eight. Note that at least once Qiujiang Yebo is mistakenly called Qiujiang Wandiao. Return to Faming Qinpu or to the Guqin ToC.